A trio of astrophysicists has found that differences between observational data and solutions brought about through mathematics regarding the mechanism involved in heat transfer from the suns center to its outer parts, can be resolved by plugging dark matter into equations. In their paper to be published in Physical Review Letters, Aaron Vincent and Pat Scott, both in the UK and Aldo Serenelli in Spain, describe how they developed several models to show how dark matter might impact heat transfer in the sun and what they found by doing so. As observational technology has improved, scientists have learned more and more about the sun, but that has led to another problem—sometimes the observations do not match with theory or models that have been built to explain how the sun works. One example, has been work done using helioseismology, where pressure waves are studied—such work has led to observations of how heat is transferred in the sun that differ from theory. In this new work, the researchers suggest the difference might be explained by interactions with dark matter. Dark matter, has of course, not been proven to exist, but evidence has piled up for the existence of some sort or matter that we cannot see or truly explain. To find out if it might be at play in the sun (captured perhaps by its gravity) the team built four models. One of the models was based on standard theory, the other three all took into account the possible impact of dark matter. The dark matter models mathematically described the possibility of interactions between dark matter and regular matter and the momentum that might or might not occur. In studying their models, they found that one, which was based on a momentum-dependent interaction cross-section, fit with observational data, if the mass of the dark matter particle was set at 3 GeV. None of the other models fit in any way. In that model, dark matter carried a significant amount of heat from the sun's core to the outer solar layers, offering an explanation of prior differences with observational data. The team plans to continue work on their models, and express hope that as they do so, workers at the LHC or those in underground facilities will finally capture evidence of the mysterious dark matter, adding considerable credence to their findings. It seems dark matter is the universal solution. Any time our observations do not match our models, we can add dark matter to normalize the observations. @above, feel free to enlighten us what else is giving so much gravity to galaxies. - Do you know anything else besides matter that can cause spacetime to curve? - You do hopefully agree we are not seeing it, yet all this "extra" gravity exists, hence referring to it as "dark" isn't that bonkers, now is it? If there are any non-crackpots here with more knowledge on this matter (no pun intended). Interesting that setting DM particles at 3GeV makes it work, it could be a hint to what DM actually is. Anyone knows if other studies verified the possible mass of DM? Seems to me using this model to add DM could also reveal more properties of DM itself. A Tritium nucleus is a much more likely candidate, IMHO. We know there's lots of Tritium in the Sun, it has the right mass and would fit the observed data. These people are just one of the crowd who are shoehorning Dark Matter into just about any theory to secure research funding or get papers published. That's bad science. Generally, when your models do not match your observations, your believe your observations and try to discover what is wrong with your models. Instead, scientists today just drop imaginary matter into the model in sufficient quantity and placed where needed to renormalize the model. That is not science. It is not how the scientific method works. Because using incorrect assumptions for your mathematical calculations is not as fun as finding evidence for something imaginary that solves all problems . . .
Gee that's tough, ummm matter that we can't see but has lots of gravity, that would be a black hole. That took less than 30 seconds to find you a solution without having to create "imaginary matter" that we haven't been able to find evidence of after 40 years of searching . . . I know what dark matter is. It's fudge. It can be used to fudge almost anything. The problem with black holes regarding missing mass and dark matter is they can only account for some of the missing matter and none of the effect. Even if there are lots more of them and they have more mass then we think there is still a lot more missing matter. A black hole's gravitational effect can't account for the large scale structure or movement of a galaxy either. At least with current theory. Yes, back in the old days, we used to call it a "fudge factor." Now it is all high-tech and called, "dark matter." I wonder it my old professors would have accepted this notion when I didn't know something. Dogbert: "That is not science. It is not how the scientific method works." Actually, this is exactly what Science is supposed to be. Now I don't want to get into a GW discussion here. I'm just pointing out that while you seem to know all about the Scientific Method, how can you attack DM predictions without any data? With the Large Hadron collider coming back to life soon, this one can be tested. Looks like good Science to me. Reset, you need to brush up on your Elementary Physics. Heat is a mechanical property, not an EM one. If dark matter is uncharged it won't absorb or emit light, but it certainly can transmit heat via collisioins with matter particles, gaining and sharing Kinetic Energy. Freshman Physics 101. Hilarious appeal to "non-crackpots", vlaaing peerd. Here's the problem: most physicists copy/recite what they have been taught/told. Leaving us today with literally HUNDREDS of unsolved problems in physics. But apparently we can ONLY solve them by using conventional physics. My theory, Spring-And-Loop Theory has gone back to square one and changed at least one major assumption -- that there is no ether. Everything then fell into place. So I must be a crackpot. @reset: I think "mscheue" is referring to the properties of conduction & convection as his reference to "mechanical property" which of course connotates the mechanical properties of kinetic energy KE=1/2 mv*2, this certainly being much different than E=mc*2 when mass is transformed to create infrared wavelengths. But you're right, he forgot about irradiation from infrared wavelengths as being the source of heat. Jesus Christ, guys! Bitter, much? It's a good thing crackpots are relegated to the comments section of pop sci news sites. Imagine if we allowed them to run our institutions. Nothing would get done. Our "theories" would contain rambling, hand-wavy, missives, in place of precise equations, and experimental data. We'd have never found Uranus or Pluto. We'd have never tried looking for them. After all, at the time, the only tantalizing evidence we had for them was mysterious perturbations in orbital mechanics. Eminent crackpots of the time would have, no doubt, conclude that all of Newtonian gravity was wrong, throw it out, and start fashioning completely new hand-wavy theories about angels out in Uranus' orbit getting drunk and stumbling around. Oh, and the AGW denialist correcting the DM skeptic for not having enough data was deliciously ironic. Good job, guys! Never change. Because that is what "dark matter" is. It is nothing more than a set of numbers that when added to a bad theory make it work. I would rather take a look of the theory to see why it does not fit observations. It is a stupid idea to add something unknown into a equation and say "now it is balanced". FIX the theory first. Haha. That would be great, except, that's how we made a lot of our physics discoveries. Planck guessed that frequencies of EM radiation within a black body is discrete, and solved the UV catastrophe. Bohr guessed that angular momentum within atoms is also discrete, and explained the Rydberg formula. Dirac guessed that the wave function was not a scalar, and used it to take the square root of the Klein Gordon equation, and predict anti-matter. Pauli suggested the existence of the neutrino to explain how Beta decay would conserve energy, momentum, and angular momentum. It wasn't until more than 20 years after that it was confirmed to exist. We have tantalizing evidence for DM. Why shouldn't we try to see what it implies? They above method leads to cherry picking and confirmation bias. 2. Find observation that supports it. Except that Newton could be seen as a crackpot himself. Having unconventional ideas does not make you a crackpot. Adhering to unconventional ideas without any solid reasoning or objectively tantalizing evidence in support of them makes you one. It is undeniable that some great thinkers have been considered crackpots simply because their ideas were ahead of their time. That did not make them crackpots. Someone who does not believe in dark matter is not necessarily a crackpot. Personally, I have an unfounded hunch that it isn't actually matter. But that does not make me an arbiter of physical theory. Experiment is the arbiter, not my gut. And guess what? So far, all our data points to the existence of there being matter. So, without a better alternative, all we can do is try to search for it. It isn't like we're sitting on our hands either. Just reserve judgement, and wait for the final verdict, or come up with a falsifiable alternative. Otherwise, you are a crackpot. Just reserve judgement, and wait for the final verdict, or come up with a falsifiable alternative. Otherwise, you are a crackpot. Exactly. What is it about dark matter that shakes the crackpot tree? It is a measurable effect. There is a ton of evidence for it. Detailed maps have been made. On the large scale it explains a lot and is well tested. On the small scale, nobody knows. Scientists are the ones confirming that we DONT yet know what dark matter is, or if it really is matter. The paper described above is an attempt to take two unsolved pieces of the universe puzzle and see if they fit together. Turns out they could under conditions they have described so they can be tested. The authors are not suggesting that they have settled anything. Its part of the search. Science. Not everybody gets it. Born in an age of wonder, crackpots criticize the explorers for not knowing the answers to puzzles before anyone has solved the puzzles. "Come over to the dark side Luke, only together can we defeat the empirical evidence." Dark matter has become quite a convenience, any time there is a lack of gray matter just insert dark matter in its place. Seems to work better than "We haven't a clue." If this hypothesized dark matter is affect the visible matter in the sun, how is it affecting the visible matter in its orbit? If it is not, then why not? Anybody ever think about this: Why would there be so-called dark matter halos found only around spiral galaxies but not around elliptical galaxies? A lot of "ellipticals" out there & many are a lot bigger than spirals but the ellipticals are absent the so-called DM features of spiral galaxies. The basis of problem is, the surface layers of Sun are heated more, than the speed of convection or even radiation allows. This problem has its quite apparent manifestation with extreme temperatures of Solar corona outside of Sun. I already proposed here, that the portion of heat from the core of Sun can be transported with fast neutrinos or dark matter particles, which preferentially interact via magnetic field like so-called anapoles. The main principle is, the fast moving turbulences of solar plasma behave like the magnetic monopoles, so they exhibit high effective cross-section of interaction with dark matter particles or neutrinos, which are of similar time-reversed geometry. This mechanism doesn't require the presence of massive particles of dark matter at all - on the contrary, the dark matter particles involved can be very lightweight, similar to scalar waves of Nicola Tesla or so-called axions. They're merely formed with fluctuations/curvatures of space-time. First explain turbulence on Earth, then perhaps we'll be closer to explaining turbulence on the sun without resorting to dark matter postulations. The above article is not trying to explain the turbulences on the Sun, but the anomalous heat transfer inside of Sun. This mechanism doesn't require the presence of massive particles of dark matter at all - on the contrary, the dark matter particles involved can be very lightweight, similar to scalar waves of Nicola Tesla or so-called axions. They're merely formed with fluctuations/curvatures of space-time. Dethe: I hate to break it to you but your theory isn't new. Axions have been dark matter candidates for years. WIMPS are the most popular candidate but based on articles I've seen lately, axions seem to be the more realistic dark matter particle because if it exists, it doesn't just solve dark matter mass issues but a variety of other problems such as the CP-Violation, matter/antimatter disparity, and seasonal x-ray variations in the sun (among other things). I'd wager that WIMPS will be dropped in the next couple years and a consensus formed on axions being dark matter and likely their discovery. The heat anomalous transfer problem is only a problem for the standard theory belief the heat comes from within, the electric sun doesn't require DM to explain the observations. The electric sun only requires the application of known electric discharge properties and known plasma physics to explain observations. Yes, I'm aware of it, but the axions still differ from anapoles conceptually, being based on breaking of Peccei–Quinn symmetry of strong force. This renders them as a lightweight strong force based analogy of neutrinos, which is not physically realistic scenario. Regarding the WIMPs, the string theorists believed, that SUSY supports heavy WIMPs, so that they enforced the the heavy dark matter particles concept. But the same scientists also have misunderstood the SUSY, which predicts very lightweight particles instead. The above article therefore considers a different mechanism, than the axions can provide. Axions are considered today because the search for WIMPs failed, but their physical nature is also not realistic. The scalar waves are different concept than axions: they don't involve strong force and scalar waves are much heavier than axinos. In their physical properties the scalar waves (low and high spin bosons) are conceptually more similar to dilatons, which are sometimes considered as a supersymmetric counterpart of axions, so-called the axinos. They can have quite tangible mechanical effects in various experiments, which the extremely lightweight axinos couldn't explain. There are another indicia of dark matter involvement in the solar dynamics. For example the outer portions of Sun rotate as a single body (roughly like the cylinder) - in similar way, like the stars at the perimeter of galaxies. It was also observed, above sun spots (which are colder than the rest of surface of sun) the solar corona gets hotter. During a sunspot minimum, the corona's temperature near the poles cools about 1 million degrees or so simultaneously in the northern and southern hemispheres. But coming out of the last solar minimum, the northern hemisphere warmed faster than the southern hemisphere. Moreover, at the high point of Cycle 24, the corona's maximum temperature was significantly lower than during previous high points in sunspot activity and the CME outbursts appear to have been erupting less often as the number of sunspots increased. Typically, CME outbursts become more frequent as the number of sunspots increases. What is it about dark matter that shakes the crackpot tree? Since an axion with this mass behaves as a cold dark matter particle, the considered preliminary detection directly concerns cold dark matter as well. Unfortunately, at least three distinct flaws make the axions irrelevant both for explanation of solar heating, both for cold dark matter. 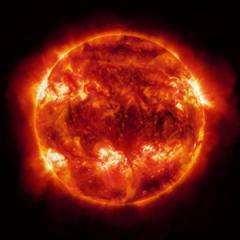 According to the so-called Standard Solar Model, nuclear fusion reactions at the sun's center pump out vast quantities of energy. About 2 percent of that energy should appear in the form of neutrinos - fundamental particles that interact only weakly with matter. But that's not what researchers see. Data collected by an Earth-based Homestake detectors over a period of 20 years suggest that the neutrino flow from the sun varies from time to time rather than remaining constant. Moreover, the flux seems to follow a pattern that runs counter to the rise and fall in the number of sunspots visible on the sun's surface. This time variation of the neutrino flux coincides with the well-known 11-year cycle of solar activity, which further coincides well with the orbital period of Jupiter planet. The neutrino flux is high when solar activity is low and declines to near-zero values as the number of sunspots rises to a peak. would you please cite your source for this? And finally we talked here about evidence of neutrino or dark matter flux from solar poles, which would resemble the jets emanated with pulsars or black holes. This flux affects the speed of decay of radioactive elements at the spaceprobes flying around Sun with frequency, which coincides with frequency of solar core rotation - not the solar surface (the core of Sun rotates significantly faster) - which would imply, the solar core is the source of this flux. Recent observations of solar heliosphere also indicate the presence of these jets, as it has an elongated shape with waving ends. - "Dark matter, has of course, not been proven to exist". Cosmology has, of course, long since "proven" that dark matter exist, else we couldn't predict the CMB spectra, gravitational lensing of galaxy clusters or even the rotational behavior of galaxies. It is the more specific properties of it that are still unconstrained. - I am amazed that the amount of solar system's dark matter, about an asteroid worth, would affect the sun. halo ..." But they also assume "asymmetric" DM, constraining it from generic DM such as WIMPs, by having a standard particle like DM/anti-DM asymmetry. That way they get much more DM in the core of a star than else, because thye have an absence of self-annihilation. Maybe this: "[science method is this way or that way]". No, it isn't. It is a lot of ways, with testing and peer review consensus building as the final arbiter. @tgbe: "If this hypothesized dark matter is affect the visible matter in the sun, how is it affecting the visible matter in its orbit? If it is not, then why not?" A good question. The answer depends of what you mean with "its orbit". DM is a massive but disperse halo around galaxies that stretch ~ 10 galactic radius out. And it doesn't aggregate or interact much with stars, say, because it is "dark" - no EM way to remove energy. So its effects is mostly felt on 10 times the galactic scale and up, from galaxy+halo rotation curves over galaxy clusters to the entire universe cosmic microwave background. The dark matter content of the solar system is about an average asteroid worth, so it doesn't affect solar system bodies' orbits. And it is dilute, so at most one DM particle hit an atomic nucleus in your body/year, raising your body heat very locally with a minuscule unnoticeable heat spike. .... The answer depends of what you mean with "its orbit". DM is a massive but disperse halo around galaxies that stretch ~ 10 galactic radius out. The vaunted DM halo does not exist around "ellipticals", & there are elliptical galaxies bigger than spirals. from galaxy+halo rotation curves over galaxy clusters to the entire universe cosmic microwave background. There is no so-called DM halo associated with "elliptical galaxies"
Really? You know this? Tell me you took apart a meteorite & you found it? Fantastic, you even know its' dilution rate & you know it is so small that we can't measure it in any meteorite we pick up from the ground. That's a lot to know about something you can hold in your hand but can't prove exists. Tell us, how did you measure that "dilution" ? "There is no so-called DM halo associated with "elliptical galaxies""
While determining the DM content of elliptical galaxies is not as straightforward as it is for spiral galaxies, the DM fraction for some ellipticals can and has been empirically deduced. Spend some time reading those papers and learn how it is done. "There is no so-called DM halo associated with "elliptical galaxies"
And mostly lamenting the dearth of DM evidence in ellipticals. But you don't know why do you? Let me clue you in, "Rotational Speed". And do you understand why? Rotational speed. DM fraction for some ellipticals can and has been empirically deduced. Spend some time reading those papers and learn how it is done. And how neatly cherry picked because you do not understand Rotational Velocity of "spirals" versus "ellipticals" that has resulted in the huge disparity for the rotational dynamics between the two types. The Milky Way rotates @ 250 km/sec, the location of our Sun @ 200 km/sec. By comparison Ellipticals rotate @ 2 km/sec. You didn't know that did you or why DM theories do not apply to Ellipticals. "Ellipticals rotate @ 2 km/sec. You didn't know that did you..."
Sigh. I see you decided to ignore my advice to read the papers I linked. Too bad. If you had you would know the E/S0 galaxy studied in the third link rotates at 229 km/s. The E galaxy in the last link rotates at 64 km/s. You didn't know that, did you? "...why DM theories do not apply to Ellipticals." Again, read my references. The paper in the first link I gave clearly states, in the abstract, that "...elliptical galaxies contain substantial amounts of dark matter in general." I would also like to point out that dwarf elliptical and dwarf spheroidal galaxies have very large DM/baryonic matter ratios. Except that Newton-Skippy was the go-to guy in his own time for figuring things out and explaining how things works. He's the guy everybody who was anybody usually gave way for. He was rude and annoying to everybody, but they still always waited on him to weigh in. And don't try Galileo-Skippy either, he was fawned over by the other smart peoples of his time too. And Einstein-Skippy too, he was the talk of the town while he was still in his 30's. ,,,,, maybe try the Google-Skippy like I did so your smart thing doesn't end up sounding silly. It only took about 45 or 30 seconds for the Google-Skippy to explain that nobody at Newton's time thought he was the crankpot. I see you decided to ignore my advice to read the papers I linked. Too bad. If you had you would know the E/S0 galaxy studied in the third link rotates at 229 km/s. The E galaxy in the last link rotates at 64 km/s. You didn't know that, did you? Sigh, cherry pick an E or two to come up with a piece of data to support your view. Slower rotating E's vs. faster rotating S's is the rule. Also E's outnumber S's & contain the vast majority of the stars in the universe. There are multitudes of E's vastly bigger than our MW, almost all with a rotational speed a mere fraction of MW's. The rotational speeds of E's do not require an extrapolated hypotheses to keep them together, their resident gravity accounts for their customary 2 km/s. Instead of cherry picking your bias for DM, do some serious reading about the "dearth of DM in Elliptical galaxies", just type that into your search. using your logic and looking for "evidence" of pyramids on the Moon, i should be able to "prove" it by simply typing in "pyramids on the moon"
does that mean, by the results, that it is REAL? Thinking about the "Many -Interacting Worlds" theory, what if a number of parallel universes is very weakly coupled together with our universe by quantum gravity? Then dark matter is just tunnelled gravitation from parallel universes. It is a measurable effect. There is a ton of evidence for it. Actually, only about 310lbs of evidence, the other 1690lbs is um... apparently dark matter. The rotational speeds of Ellipticals's do not require an extrapolated hypotheses to keep them together, their computed resident gravity/centripetal forces accounts for their customary 2 km/s. Put in a little study time extrapolating data from Rotational Curve graphology, what you will learn is that Ellipticals rotate so slowly that Rotational Curves for them have never been derived, only for Spirals have such curves been derived. especially considering your previous comments about galactic years, milankovitch cycles and the timing of them. the wobble cycle of Earth's rotational axis seems to correlate closely with the time required for our solar system to complete a full orbital passage around the galactic core of the Milky Way. so, was that a math error, research error, or just an ordinary brain fart? i think math error, considering here: : http://phys.org/n...html#jCp ! I don't have the time to parse through somebody else's inability to properly format their math to make it intelligible.... something about ODE whatever that is? There is quite a lot of theoretical work upon the mysterious dark matter. My issue is we may have accepted a false statement. Einstein's E=MC^2 is based upon the quantum mechanics, the wave equation and the deBroglie wavelength. This would imply that actual matter is not represented. Also, more study should be applied to show that gravity is not a separate force of nature. The idea of creating something more bizarre than our "error in theory" only adds another error, especially using an unknown idea of invisible matter with unknown properties. This implies we should actually start over. Explanations with false theory is subject to many false results. The acceptance of this sort of activity does not seem to be scrutinized by sound physics. So these sort of studies should placed into another category and not science. Does dark matter explain the motion of stars around a galaxy? Base Concepts link-up to prime concepts. need to search origins- cosmology interlinks Vedas. The concept of matter under flow must be understoos wit comprehension-Cosmic Pot Energy of the Universe. So the vector field or the Poynting Vector, is simply a constant? The wave front we can measure! The "Redshift", but this is only speed; it can be + or -, and the limit may be from -infinity to +infinity, simply locate "a" known event within the spectra. But at least supply a set "basis" for a theory to be acceptable. Hello, is anybody awake? The speed of what I call the wave-front is the original length of a wave-let divided by the period I measure. Real Length/Time, speed! Something went by!! You can figure it out from there. Can we focus our eyes with something that makes sense? That is, select each item and define a logical set of trajectories based upon known physics, the free constant no bigger/smaller than what is verifiable. You may at least see how it relates to every other body relative to us. It's algorithmic! Big Bang? Probably the mechanical model of a stars heat generation is two fold ,that of fussing atoms together into new elements and in the core where compression and pressure is so monumental that those atoms reach their structural limits and cannot keep their structural integrity (there volatile any way as heavy atoms with alot of parts) so they come apart and form a particle plasma field made of those charged particles and parts they were constructed of . Which is a secondary heat source. Is there any better mythology or Science you can offer, anything at all ? and at the same time over the whole world - OR only now and then to suit humans ? Can u answer that - even a little ? WHY can't u answer ANY of my questions, are you not getting data from your 'creator' ?